As part of my 2014 goals, I’ve decided to try out a new exercise class at least every other week. 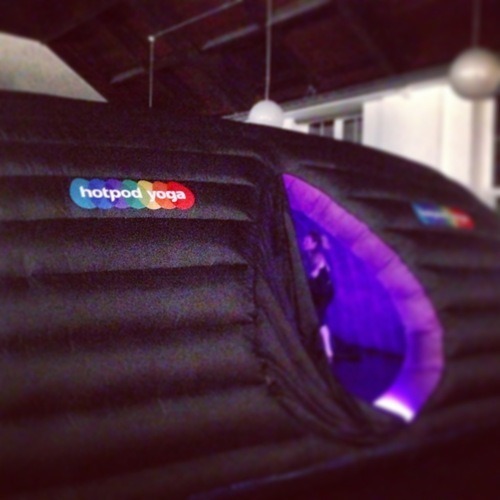 This week’s new adventure was Hot Pod Yoga at The Trampery on Mare Street, Hackney. I’d always avoided bikram or hot yoga in the past as I suspected that I wouldn’t enjoy it. I’m great in the heat as long as I’m lying in a hammock with a book. Having to actually do anything when it’s hot makes me grumpy. Good start. First off, the space. The inflatable pod is up on the first floor and first impressions is that it looks like a giant purple and black bouncy castle with a roof! – Would it smell of sweaty people? – Would the mats be clean? – Would it have that slightly moist sweaty thing going on that bouncy castles sometimes have…? You can breathe a sigh of relief, it was beautiful inside! It was clean, smelt like eucalyptus and the mats were spotless. The hard floor meant that once you were inside it didn’t feel like a bouncy castle any more. 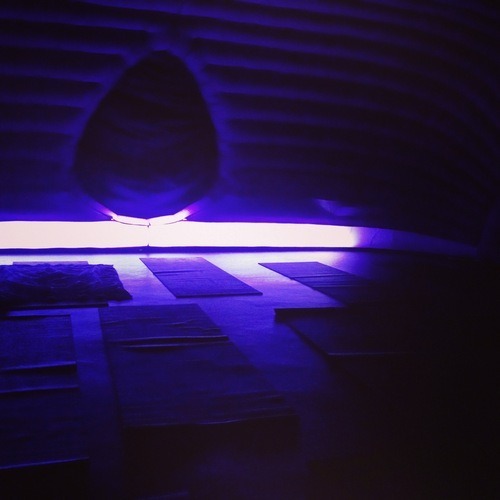 With the purple walls and lights it felt like being inside a tellytubby’s tummy. In a good way. And so to the yoga. It was Vinyasa Flow which I’ve been doing for the past 8 months or so with the lovely Jess at Fat Buddha Yoga so it felt comfortable. You flow through a series of asanas, working your whole body, especially your core. It’s not for those who come to yoga expecting an hour of meditation! However, it was slightly faster than I was used to and the sweat pouring off every part of my body made the mat slippery which complicated some poses. Overall, I found it difficult to focus on the poses as the dripping sweat completely distracted me. Within about 15 minutes I was praying for the end of the class so I could get a gulp of fresh air. It was a good experience and I slept very well afterwards but it’s not for me. It was too hot, I couldn’t concentrate and an hour was a little bit too short. However, for someone looking for hot yoga I would definitely recommend it for being a clean, professional and affordable option.